Up this morning for a spot of sunrise shenanigans, and I was hoping to get a few images of the River Exe as it curled its way through the surrounding valley, but that proved slightly difficult, as not only was the river completely obscured by a thick shroud of early morning mist, but most of the valley was too. When first arriving a fine mist was settled in the valley, and there wasn't much colour in the sky. Still, I had motored it over to Simonsbath for the view, and I wasn’t about to just give up and go quietly back to my tented lodgings, besides a bit of mist can sometimes be a good thing. Plus, I had managed to borrow a tripod, and I was damn well going to use it, otherwise there wouldn’t have been any point in going out at all in such low light. After a little while the colour started to make an appearance, and the mist began to increase. So I spent the next hour or so snapping away at the vapour filled vale in front of me, while out of sight, the River Exe spirited along its twisty circuit across the valley floor. Despite it being, at this section anyway, rather weedy and emaciated, it’s certainly well represented in the area. 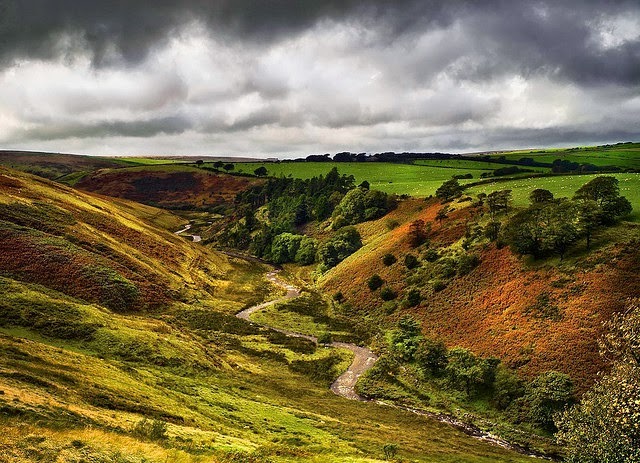 It’s the basis for the name Exmoor itself of course, plus the city of Exeter, and the settlements of Exford, Up Exe, Nether Exe, Exwick, Exton, Exminster, Exebridge and Exmouth among others. Which is a lot of ex’s. After a while the sky developed a bit of colour, and finally, after a little wait, the sun rose above the bank of murk on the horizon, giving some life to the gloomy morning. So it was worth getting up for sunrise in the end, as it usually is to be honest. Even if the shots aren’t spectacular, there is something gratifying about having a place to yourself and watching the landscape transition from night to day. By the time the sun appeared the mist was overflowing the Exe valley. Here's a couple of close up shots of the valley sides in the mist. I then returned to the campsite to get a bit of breakfast and a welcome cup of coffee, before heading back out proper. First up was a welcome find in the shape of the Barle Valley. This was a place I had been to briefly many years ago and got a picture, but hadn’t taken any notice at the time of where it was, and on subsequent visits never been able to locate it again. It was one of those places, at least to me, that seemed almost perfect, I wouldn’t have used words like breathtaking or awe-inspiring to describe it, more like beautiful, winsome, delightful and such like, plus it had a kind of alluring potential, like it might be hiding some concealed treasures, if someone had the time to search for them. You would think that it might be a hidden place, a secret place, it isn’t, I was just too useless to stumble across it again, but thankfully, my stumble had launched me in the right direction this time, and once found I was determined to get a decent picture of it before I left. But now was not the time, the atmosphere was too hazy and the light too flat, so I drove north over the moors and towards the Valley of Rocks. Situated just outside Lynton, this spectacular dry valley that runs parallel to the north Devon coastline, is home to some magnificent stone fortifications. Natural rock structures that seem to impose their might on the surrounding landscape. But I wasn’t stopping at these beauties today, I carried on driving, taking the small lane that rises and sweeps along the coast, carving its way through a thick forest of verdant ferns, towards Lee Bay. I stopped at Lee Abbey, now a Christian community retreat, to pay the toll, before heading down towards the village of Lee Bay. I parked up and took the stroll onto the rocky beach. The light was still very hazy and the sky somewhat lacking in any interest so I didn’t stay long. On the way back though I stopped by the abbey and took an excursion into their well manicured garden, to get a shot looking back towards the bay below, which was quite a nice view. as they dipped down towards the curve of the bay. I picked up a spot of lunch in Lynton and drove along the coast to Cantersbury Hill, where I took a ramble along a section of the Southwest Coast Path, one of England’s longest footpaths. 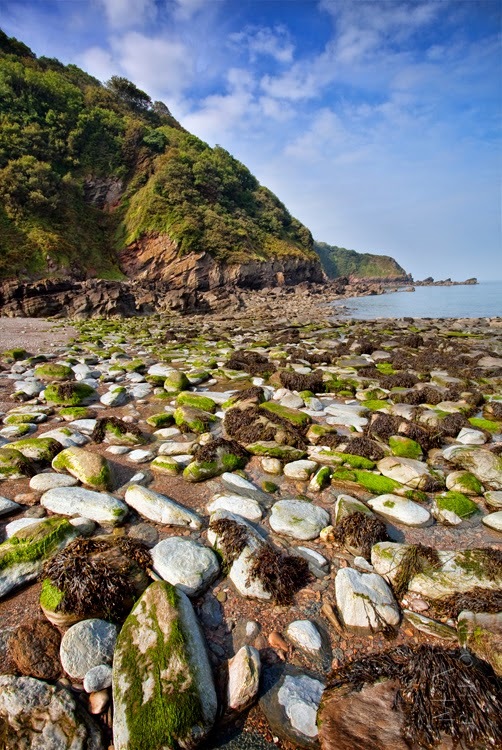 It stretches from Minehead in Somerset, along the coasts of Devon and Cornwall, to Poole Harbour in Dorset, and since it rises and falls with every river mouth, it is also one of the more challenging trails. The total height climbed has been calculated to be 114,931 feet almost four times the height of Mount Everest. Needless to say, my little amble was slightly less challenging, probably totalling the height of a rudimentary hillock. But with lovely views along the coastline to Lynton & Lynmouth, and the warm sun on my back, it was a pleasure to saunter in the ocean breeze. A view out to a lonesome boat, with the distant haze obscuring any notion of a horizon. Afterwards I took a quick divert into Porlock Wier, but the place was packed so I didn’t stay long. Instead I carried further up the coast to Bossington and wandered along to the beach, which turned out to be a rather dull affair, so yet again, my visit was brief. But before leaving Bossington, I stopped in Kitnors Tea Room for a cracking ginger beer to lift the spirits by jove! After that I drove back to the campsite for a shower, before heading out for sunset at Barle Valley, in the first of my attempts at a decent picture. I got set up and watched with growing dismay as the sun cruelly disappeared behind a bank of ashen cloud, as if it had a personal grudge against me. first shots I got, before it did indeed become rather drab. And there it stayed until it set, well I assumed it set, I saw none of it, so I will just have to take it on good faith that it did. I hung around for a little while afterwards, in the vain hope that something interesting might happen, but it was just unremittingly dismal and grey. So I trudged back to the car and packed away the gear. I was about to leave when I happened to look back and saw that, against all odds, a subtle pink hue had appeared in the clouds. It wasn't extraordinary, but compared to what it had been so far, it was a revelation. I was furious! This was what I managed to get, despite my best efforts to sabotage myself. I quickly unpacked the gear and rushed over to the nearest spot to set up as fast as my incompetent legs would carry me. I managed one shot before the rapidly disappearing colour was completely extinguished. I could have kicked myself, if only I’d waited another 5 minutes, I would have been able to salvage something from, what seemed at the time, a rather fruitless evening. I headed into Simonsbath for a slap up fish and chip supper at The Exmoor Forest Inn, not that I deserved it, then back to camp for an early night, and the sincere hope that sunrise might bring something to cheer me up.